Contribute pictures, update details or suggest corrections for Butch Cassidy. 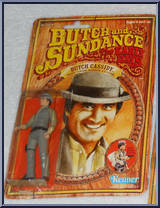 Write a review about Butch Cassidy. Both Tom Berenger and William Katt captured nicely in 3.75" scale - both resembled Paul Newman and Robert Redford in the original film (Redford bares the best physical resemblance to the real-life Harry Longabaugh Sundance Kid). This figures had awesome quick-draw action and the ability to ride horses. This is a Western-themed line I enjoy the most next to Bonanza.